What are you and Captain Howdy up to today? Are you going to play in the attic some more? Or maybe go jump rope outside? How about shaking the bed in the middle of the night and scaring the living daylights out of your mother? Sometimes our imaginary friends start to get just a little too real and close for comfort (like, invading our bodies, minds, and souls is not our idea of “Sharing Is Caring”, mmkay?) 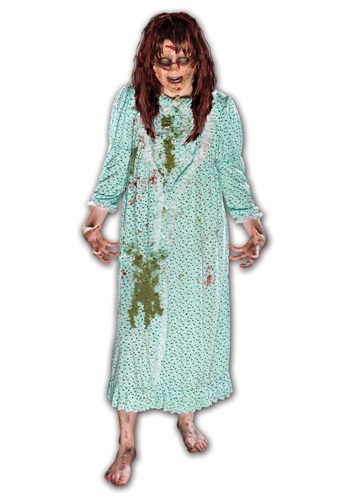 so get a jump on the exorcism by instantly transforming from the loving, shy, creative young girl Regan used to be into Pazuzu, the scariest demon of them all with this The Exorcist Regan Costume w/ Wig! Seriously, there’s not much we’re scared of, but demon possession freaks. us. OUT! 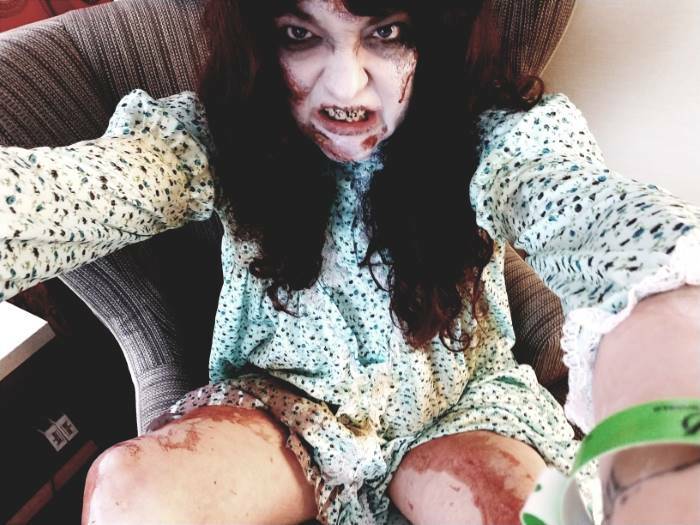 But reminding everyone of the most horrifying and disturbing movie of all time is your idea of a fun Halloween, then consider this The Exorcist Regan Costume w/ Wig the divine intervention you need! Made of 100% polyester, this floral print nightgown has lace trim around the collar. Green vomit stains also accent the dress (for that demon-puke realness!). The costume also comes with an auburn straight-haired wig. Just add a demonic mask and you’ll not only be the picture of every parent’s worst nightmare, you'll instill cringe-worthy memories of late nights praying fervently for protection from demons everywhere you go! Enjoyed this costume and showing it off. I added more blood on dress because it looked fake but between my makeup and this outfit I think I got my point across. Your added touches make the costume look even better! Thanks for the great review, and we hope you didn't have to consume any pea soup throughout the process.